New points leader- The team of Jennifer Guenther and Pete Maduri Jr! 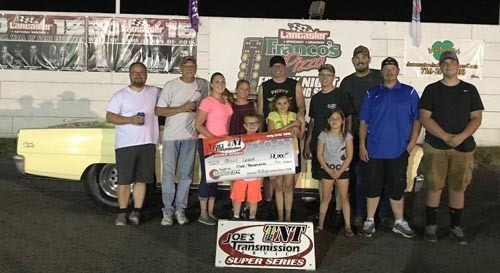 NEW YORK -- The Joe's Transmission TNT Super Series saw a new winner this weekend with Billy Leber taking the $1000 big cheque on Friday while Harry Phelps took it Saturday. Presented by Halleen's Automotive, the weekend kicked off Friday at Lancaster Dragway. Joe Karosik got the #1 qualifier spot with a perfect 7.000. But in the end, it was veteran racer Billy Leber driving his dad's 1967 Chevy through the field to victory. Leber tree'd Bob Heans in round one and was near perfect in round two with a 001 against Tyler Halleen. A bye in round three set him up to face Steve McCarrick in the semi's. Only .003 separating them off the line, they crossed the stripe at 7.005 / 7.004. Margin of victory .002. McCarrick had to settle for the $225 round money for losing 4th round. Into the money round it was Leber against Lancaster regular Jeff Sobczynski. Leber's 005 to Sobczynski's 019 made the stripe easier for Leber with a 7.015 to a too fast 6.996. A .004 finish margin. "I want to thank my dad," said Leber. "and of course Mickey Thompson Tires for their support. I've run this series a bunch of times and winning one of these was on my bucket list!" Leber now qualifies for the REVS Full Throttle Powersports RACE OF CHAMPIONS coming up in a week and every year from here on out. 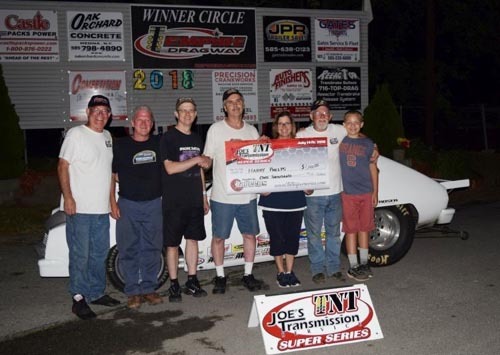 Saturday's action saw the series head to Empire Dragway where Bob Bauer posted a 7.000 to take top spot. After a 60 minute downpour at 5:00, the Empire crew dried the track to perfection and Harry Phelps marched through the field to light the final beacon. In round one, Phelps got Bob Heans with a starting line advantage. He did the same in round two with Chris VanBaalen going red. Round three he was 009 to Ted Barnes' 029. Then JJ Jablonski turned it red to him in the semi's and set him up to face Friday's winner, Billy Leber. Phelps was 003 in the final, running 7.016 or 19 total. Leber was 019 at the hit - which meant he'd have to be perfect on the big end - but he was 7.008. Not a bad run but 8 too many. "I was one of the doubters that we were going to get this race in due to the rainstorm, but thanks to the Empire staff for doing a great job getting the track dried," said Phelps. "The traction was awesome all day, so thanks to Empire and my Hoosier tires for that and Hoosier's support of our series. Phelps qualified last by being too quick. He said he couldn't seem to get the car slowed down enough. "It took until the fifth round to finally get it right. I want to thank my wife Audrey for bearing the heat with me this weekend and Laurie Orr for all her hard work keeping things running smooth." Phelps was quick to thank Halleens Automotive. "For not only sponsoring this weekend but racing with us too. Also thanks to Ted Barnes, Joe Boniferro, Hoosier Tires. Auto Meter, Altronics and Joes Transmission," he added. Next up are Races 9 & 10 along with the REVS Full Throttle Powersports RACE OF CHAMPIONS at Toronto Motorsports Park on July 28-29. To learn more about the Joe's Transmission TNT Super Series and how you can become a part of it, visit http://www.tntsuperseries.com/ or https://www.facebook.com/TNTSuperSeries/ and sign up for the mailing list.